Has the ability to backup a 3-ton air conditioner, well pump or water heater, and the main rooms of your house. Package includes RTSW200A3 service rated automatic transfer switch with Smart AC Module to manage multiple air conditioner loads. Compatible with Smart Management Modules for addtional load management, Smart Management Modules p/n 6873 are sold separately. Easy Installation: When combined with a pre-wired transfer switch or any of Generac’s selection of automatic transfer switches and composite mounting pad that eliminates the need for a poured concrete base (unless specified by local codes), the Guardian Series 11 kW generator is easy to install. 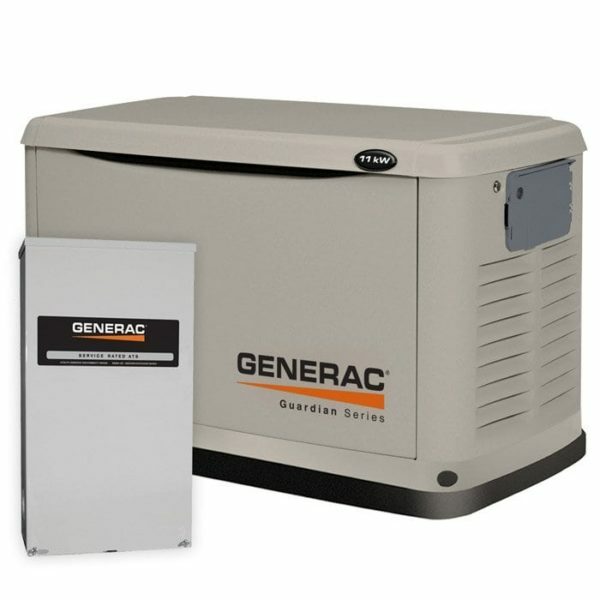 Rated for Operation in Areas with Low Natural Gas Pressure: In areas with low natural gas pressure, the Guardian Series 11 kW generator can operate on natural gas pressures of only 3.5” of water column. All-Weather Steel Enclosure: Our durable powder-coat finish helps make the sturdy, galvanneal steel enclosure perfect for all weather confitions. It’s also able to withstand 150 mph winds. Optional aluminum available on Model 6721, recommended for salt-air locations. 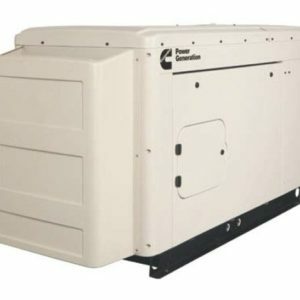 Quick, Quiet Exercise Test: Standby generators require a short run-time periodically, known as exercise, to test and ensure the system is functioning properly and ready for an emergency. The Guardian 11 kW self-test runs for only twelve minutes. Choose your schedule – weekly, bi-weekly or monthly. 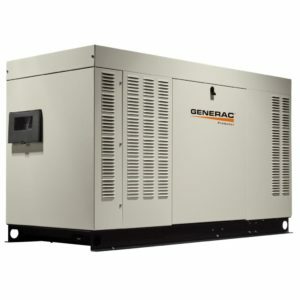 6438-2 Pre-Packaged with: RTSW200A3 – Generac 200 Amp Service Entrance Rated Automatic Transfer Switch in Nema 3R (Indoor/Outdoor Rated) Enclosure, Flexible Fuel Line Connector and attached Composite Mounting Pad. Note: The RTSW200A3 is compatible with Smart Management Modules, Smart Management Modules are sold separately. Picture is representative of actual product.